The Wall Street Journal has a good story on doggie daycares this morning. It’s a review of five daycares across the country. But rather than just interviewing people who operate the daycares, they also got input from the experts…their own dogs! These days, people are getting increasingly picky about choosing day care — for their dog. As demand for pet-care services grows, formerly bare-bones kennels have added posher day-care services. The facilities now offer everything from Webcams that allow owners to keep tabs on their pets to doggie massage. Americans will spend an estimated $43.4 billion on their pets this year, up slightly from $41.2 billion last year, according to the American Pet Products Manufacturers Association. “The marketplace has moved away from just having what would be referred to as a boarding facility or kennel,” says Joseph Lyman, chief executive of the Pet Care Services Association, an industry trade group. We sent our pets to five day-care facilities across the country to find out whether the cost was worth the extra pampering and attention. 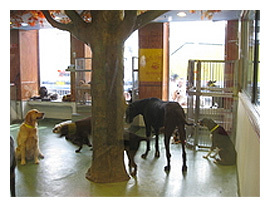 At all five locations, dogs are split up into rooms by size and spend the day interacting with other pooches. Rates were about $20 to $35 a day, with discounts for buying several stays at a time. Dogs had to be picked up by closing time, or owners were charged for overnight boarding fees. All facilities required proof that our dogs were up-to-date on vaccines. Pets also had to be spayed or neutered to be placed in a room with other dogs. And all but one day-care center first evaluated our pets to ensure they weren’t too aggressive and could get along well with other pooches. Each dog came home relaxed and content — and in some cases, downright exhausted from a day of fun. Boomer was a bit tired, and Mucho and Conan slept for hours once they got home. Finn fell asleep as soon as he climbed into the car. Read more about the five daycares the dogs visited here. If you want to learn more about doggie daycare see our FAQ page, and of course, you can search for dog daycares, dog walkers, & pet sitters from the front page of our website. I swear that shadowy figure in the middle is a donkey! Donkey Daycare! LOL! I had to look at the picture again. I think it really is a dog but ya know…you may be not something. Donkey Daycare!